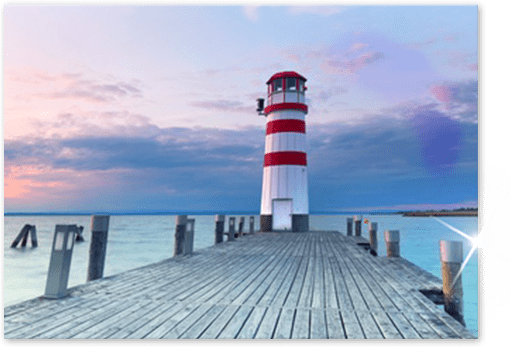 Print on plexiglass – NEW: 100 % FREE delivery – over 50 sizes! We use only the best materials to produce your photo on plexiglass. We use high-gloss XT plexiglass. Plexiglass is shatter-proof and more translucent than mineral glass And, due to the considerably lighter weight, the material is particularly suitable for large-format images. 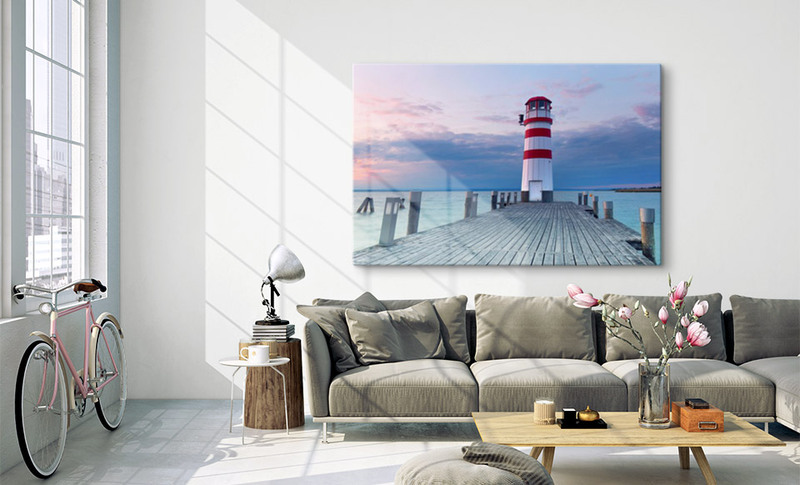 Your print on plexiglass is considerably lighter than it would be on glass and is thus much less complicated and safer to hang as wall art than mineral glass. 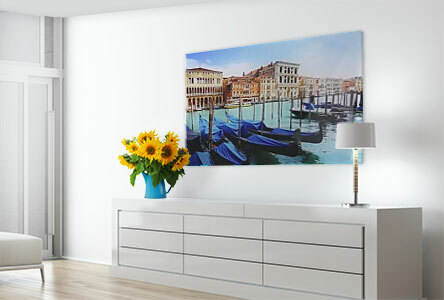 Direct printing of your print on plexiglass in fine art quality also allows you to hang your print in the bathroom or kitchen. Because, unlike cheap laminates, the print does not peel away from the plexiglass plate when it gets damp. Tip: A print on plexiglass is waterproof and can also be hung in the bathroom, for example. The printing process for plexiglass pictures is oriented towards the requirements of the large galleries and international photographic artists. For major exhibitions, these have their photos reproduced almost exclusively as prints on plexiglass these days. Each image is printed in three ink layers behind the plexiglass plate. 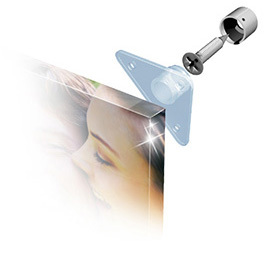 This ensures not only perfect plexiglass images with high colour density but also a degree of paint cover that is unique to plexiglass photo prints. Not only does the glass plate create a high-class impression, it also protects the print from damage. If you place great value on the quality of a print, you’ll find a print on plexiglass is the ideal solution. If you want to create your own print on plexiglass ,you’ll be spoilt for choice when it comes to formats. From relatively small plexiglass pictures of 40 x 30 cm to XXL formats such as 160 x 120 cm, we offer more than 50 different sizes for your acrylic prints from photos. And each format is available in both standard and premium variants. We can also produce custom sizes and panorama formats on request. This guarantees that everyone can order exactly the plexiglass pictures they need. Standard format plexiglass images are delivered a few days after receipt of the order. Custom formats on the other hand can take up to 2 weeks. A print on plexiglass needs a special hanging system for attaching it to a wall. After all, plexiglass images can’t simply be hung using a nail. There are two tried and tested approaches: Large plexiglass pictures are hung these days using stainless steel hanging systems. 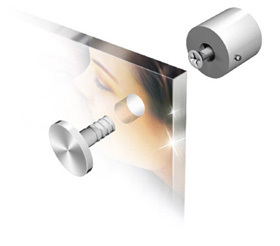 This looks very exclusive and can secure even heavy plexiglass pictures to the wall. However, it requires that four holes are drilled into your photo on glass. 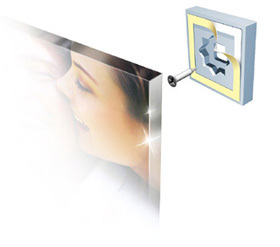 Small and medium-sized plexiglass prints can be attached to the wall using a free floating hanging system. This is attached quickly and easily and is invisible to the viewer of the picture. This gives the impression that picture is floating freely on the wall, underlining the elegance of the plexiglass photo print even more.